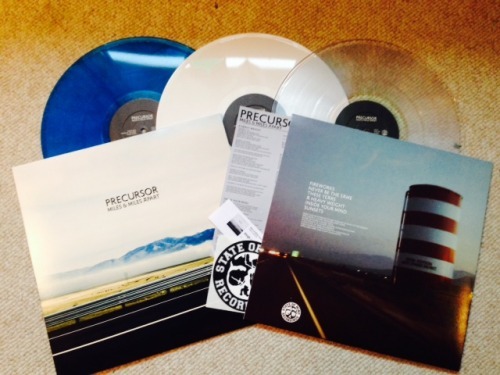 PRECURSOR Miles & Miles Apart 12 inch PRE ORDER up now! Featuring members of DAGGERMOUTH, THE FULLBLAST, CARPENTER, and more. PRECURSOR hails from Vancouver BC, no pop punk cheese ball songs about friends here. No studio magic either. Just some grown men playing some fast melodic punk rock. PRECURSOR delivers wild drumming, jangly guitars, big veiny bass, and some of the best vocal delivery in the genre. Don't be a poser. This includes a digital download coupon for the whole record. For fans of HOT WATER MUSIC, TOUCHE AMORE, and DAGGERMOUTH. Just got in the leftover shirts from the DEAD HEARTS reunion. These are very limited and we only have a few of each. 2 different designs one is a long sleeve. It is the knowledge that a lot. I try and keep as much as possible. To be asked to share with my friends. Is this still available? I would like to order, but do not know if you still receive pre-orders?